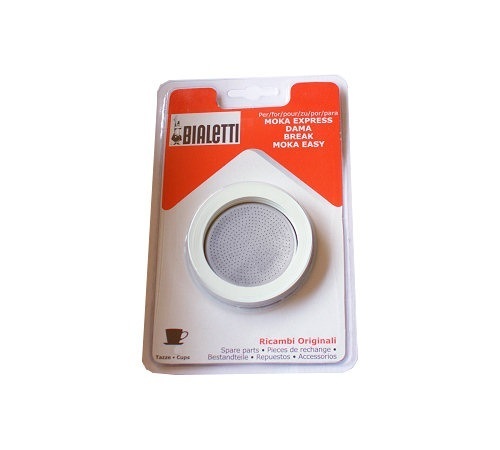 A set of 3 Bialetti joints and 1 filter for 12 cups stainless steel moka pot (Moka Express, Dama, Break). The popular brand Bialetti began in Italy. In 1933, Bialetti released its first Moka Pot. Thanks to that product, Bialetti has become among the most known brands in the world. Thanks to the high standard of their products and by combining their advanced technology and style, they manufacture kitchen utensils which are easy to use, functional and simply beautiful : simply gorgeous. The Able permanent filter is the ideal solution to stop using paper filters. The filter holes are so small you can make a cup of coffee similar to those made by Chemex classic filters. Replacement part for all Bodum 4, 6 and 8-cup French Press coffee makers (500ml -1 litre) with a nylon mesh filter. Bialetti filter funnel for 6 cups moka pot (Induction models such as Bialetti Venus, Musa, Kitty, etc...).